An Artist’s Concept of New Horizons at Pluto. The new horizons mission was the first of the new frontiers program. 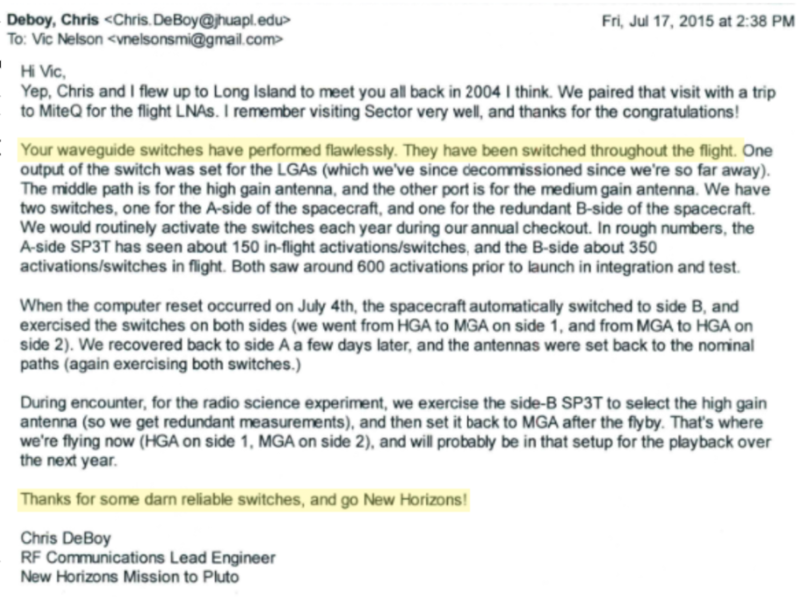 launched in 2006, this spacecraft did not reach pluto until july 2015. Upon its first flyby study, clear images were sent back through smi technology. it is essential that these switches are made to withstand space environment and function on command. This switch saw little communication for the better part of 6 years, but was perfectly functional when activated. This can be considered smi’s legacy. the new horizons mission was created to analyze various properties of planets and objects in the Kuiper Belt, which is considered the highest priority of space exploration by The National Academy of Sciences. this is the first ever reconnaissance of this dwarf planet. New horizons’ mission was extended to explore beyond pluto; the spacecraft is now a billion miles outside of pluto’s orbit. On january 1st, 2019, new horizons flew by the farthest object ever explored: 2014 MU69, nicknamed Ultima Thule. This object looks like an icy-red snowman. Higher resolution pictures are expected in a year, because this older spacecraft does not contain the newest technologies. However, it is impeccable that the switches transmitting this information perform flawlessly, 4 billion miles from earth, after years in space.